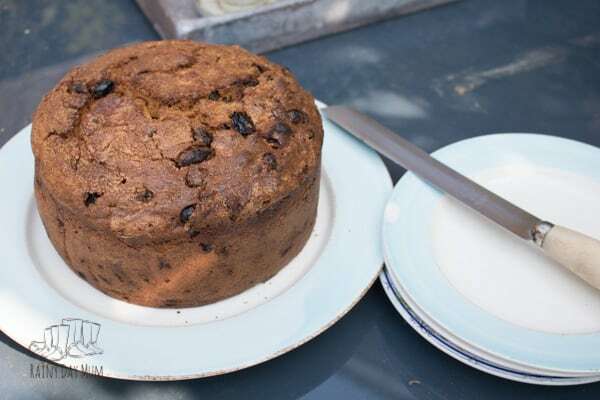 One of my favourite cakes (you can have more than one) is a traditional fruit cake. My mum and my grandmothers had their favourite recipes and over the years I have combined them and taken my favourite bits from each and created my own version. I’d written it down on a recipe card and somehow lost it! So a quick phone call to my mum and I had her recipe and my grandmothers. 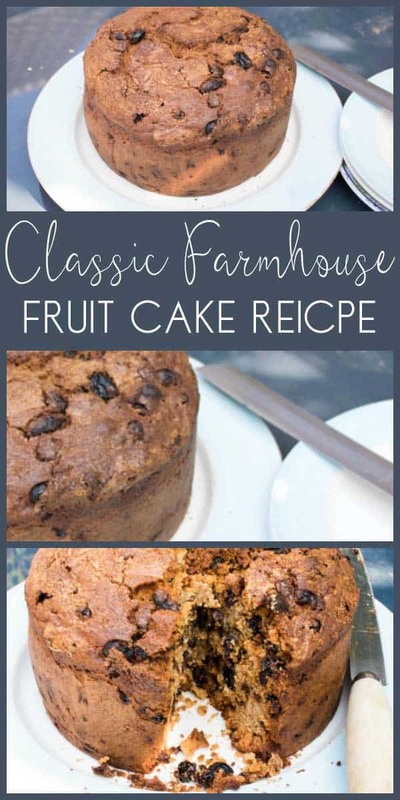 So I spent the weekend recipe testing with some very willing volunteers to recreate my Classic Farmhouse Fruit Cake Recipe and so I don’t lose it again I’m sharing it with you here on Rainy Day Mum! 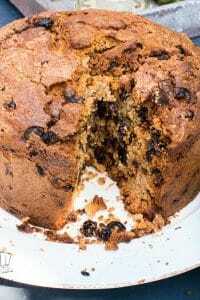 A warning that this is not a recipe that you can make quickly it will take a while but as my husband says it’s worth it! I’ve included some tips before you get to the printable recipe card (so that you can print, use and the lose the recipe just like me!) 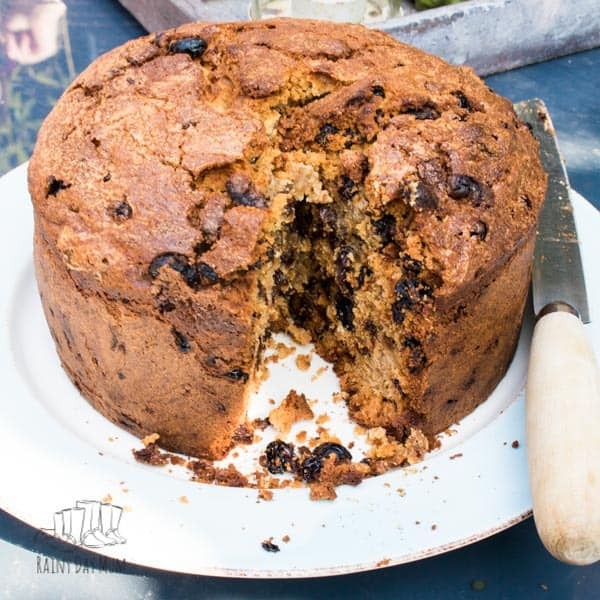 on how to line a cake tin and how to avoid burning the top of the cake when it’s going to take a good 2 – 3 hours in the oven! 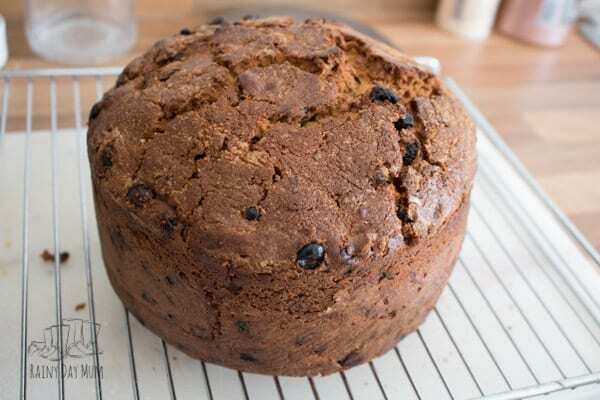 But, this traditional fruit cake recipe is simply delicious and well worth it. 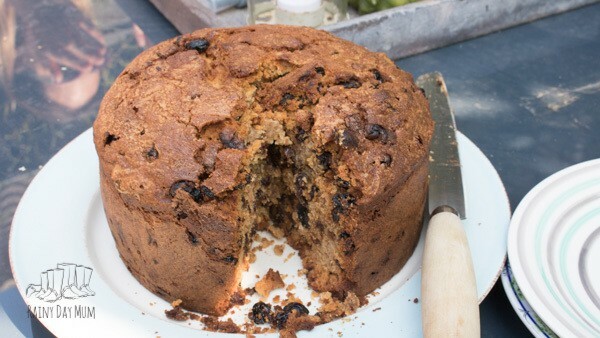 I don’t know about you but I love a chunky fruit cake so I use the same cake tin that I bake my Christmas Cake in and it works perfectly giving a “whopper of a cake” as one of my friends said. It’s an 8inch round cake tin 3inches tall with a removable base something like this cake tin here. I line the tin with silicone paper and some butter it prevents the cakes from sticking and they come out perfectly every time. See our step by step guide to lining a cake tin. 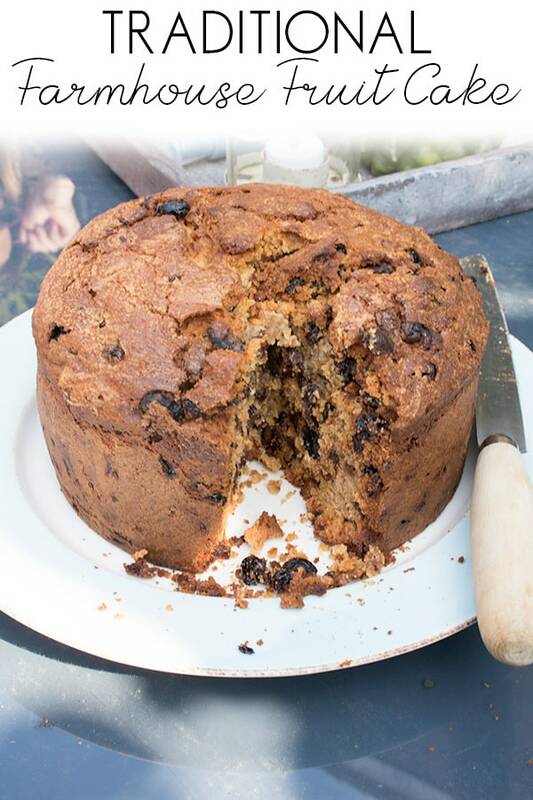 One of the problems with cakes like this and our heavier Christmas Cake is that it takes so long in the oven that it can burn on the top instead you can easily prevent that when halfway through the cooking you place 2 pieces of Aluminium Foil over the top in a pocket. This will prevent the top burning whilst allowing the air to circulate. 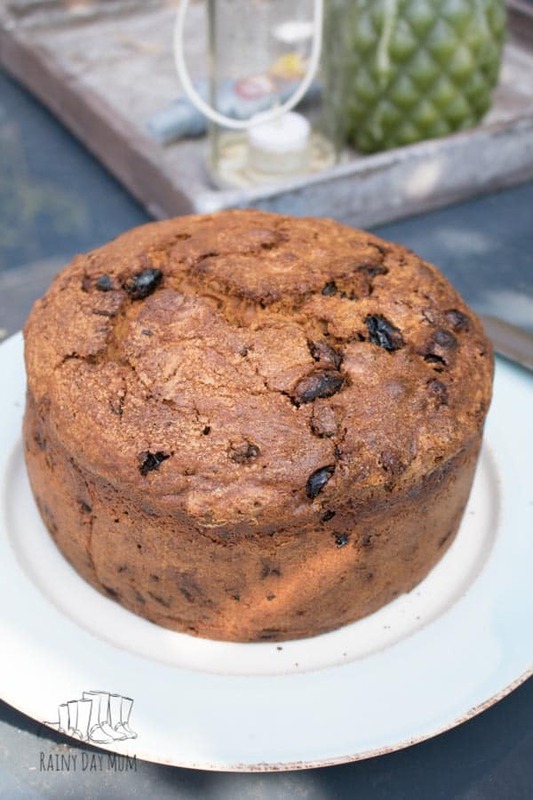 Delicious old fashioned fruitcake recipe, just like it's straight from the farmhouse. 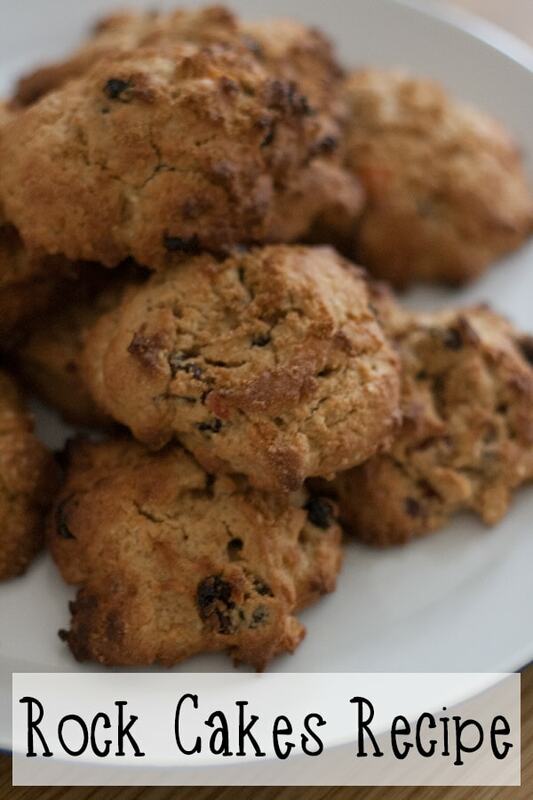 This classic recipe for afternoon tea or just to enjoy anytime. 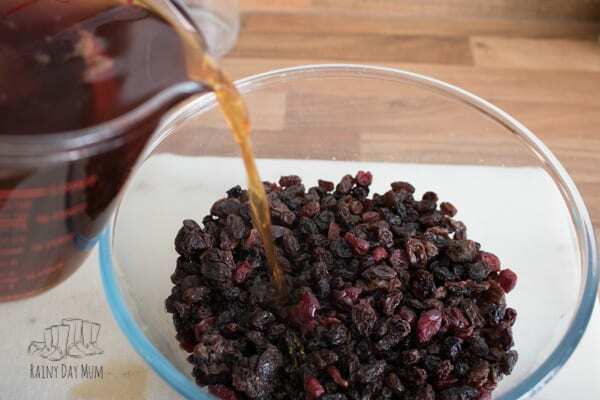 Place the dried fruit in a bowl. Pour over the warm strongly brewed tea. Stir and cover for a minimum of 1 hour. Grease and a line your cake tin. After 1 hour pre-heat the oven to 150C. Add the flour, spices and salt to a bowl and mix. In a stand mixer cream together the butter and the sugar until smooth and fluffy. Whilst that is mixing drain the dried fruit and lay on a clean tea towel. Pat dry. To the butter and cream mix add 1 egg at a time. With the last egg add a couple of spoons of flour this will prevent it curdling. Now add the flour and milk in 2 batches to ensure it's fully mixed. Half the flour and half the milk first and combine and then repeat. Fold in the dried fruit. 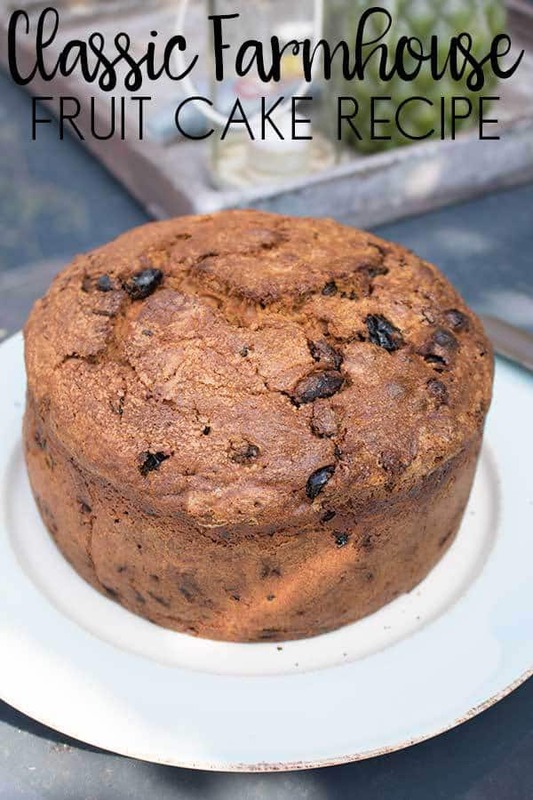 TOP TIP - To prevent the fruit from sinking to the bottom coat in a little flour before adding. 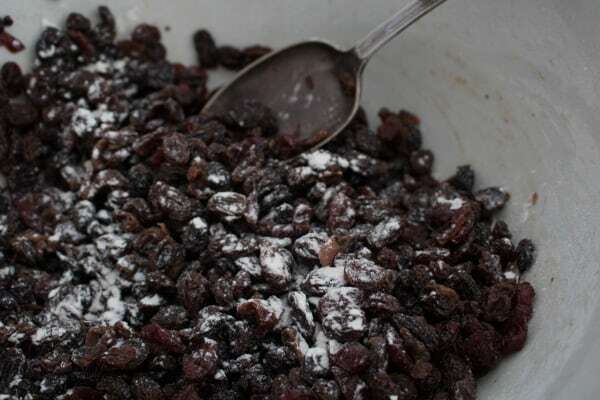 Add the mixture to the cake time and even out the top. Set the timer for 1hr 30 minutes. When the timer goes off cover the top of the cake with foil to prevent burning. Take out the cake and check with a skewer. If it comes away clean the cake is cooked. If not return to the oven and cook in 10 - 15-minute stages until the cake is cooked. It can take between 2 and 3 hours to cook depending on your oven and the cake! Once the skewer comes away clean remove from the oven and leave to cool for a few minutes. Remove the cake tin and cool on a cooling rack. 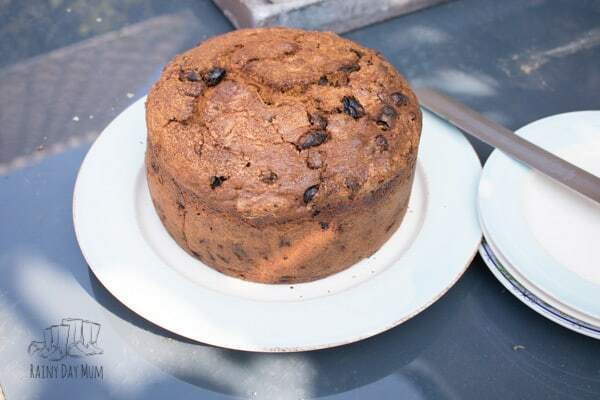 This cake is great served warm or cold so enjoy once it's stopped steaming. You can skip the soaking fruit stage but when the fruit is soaked they become plumper and more delicious. This is my favourite cake pan with a springform and removable base it’s ideal for making cakes like this. I won’t lie to you, I really want a Kitchen Aid Stand mixer and at some point, I am sure that I will buy myself one as a treat. However, until then I have a version of this stand mixer in cream which goes with my other appliances it does the job and costs a lot less than the Kitchen Aid that I really want! My mixing bowl is old – it was my grandmothers and I inherited it because of the memories made cooking together with her. It’s very similar to this Mason and Cash Mixing Bowl and whether it is because it is so solid and old-fashioned or because of the memories I love bringing it out of the cupboard. The kids know that when it comes out that means that some serious baking is going to take place! 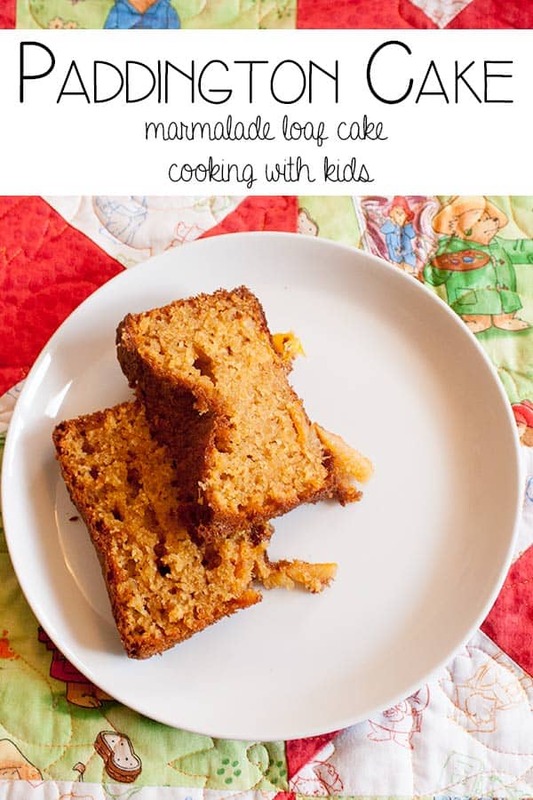 The kids favourite cake to make is our Apple and Cinnamon loaf cake. It’s delicious and so sweet perfect for some baking together. Strawberry Coffee Cake from 3 Boys and a Dog easy to make and tastes delicious. Something a little healthier? This Skinny Strawberry Banana Bread from Ruffles and Rainboots is ideal. How long does this keep for -please? It disappears within a couple of days in our house but we have frozen and defrosted so that it will last for months. When we have left it then around 3 to 5 days maximum.